Come and stay a little while in one of the highest cities in the world with one of the biggest Lakes in the world, definitely the highest. Explore the area of Puno and Lake Titicaca. Jenny and Carlos are waiting with a warm welcome in our Pirwa Hostel in Puno. They know the city and the surrounding area pretty well and are more than welcome to help you with any query you got. 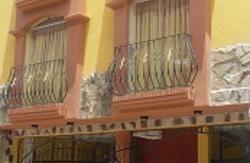 The hostel is in the perfect location, only two blocks from the Plaza de Armas and the Cathedral. All the things such as ATMs, Restaurants, cafes or artisanal centers are within a reach of 5 minutes walking. It takes only 15 minutes to get to the harbor of Lake Titicaca and 10 to the viewpoint of Puno. The building is fairly small, which creates a very familiar and cozy atmosphere. You can choose from a variety of small dorms and private rooms which are all connected to the patio. Our common areas respond to the desires of any kind of travelers. Prepare yourself an invigorating meal in our self-catering kitchen, read a book in our patio or enjoy a couple of drinks in our in-house bar, which, if you are lucky will be served by Carlos in person. The services include, free Internet and WiFi, free Breakfast, 24 self-catering kitchen, 24 hour reception, lockers, free towels, free luggage storage, TV, in-house Bar, knowledge of our local staff and a lot more! Come and visit Jenny and Carlos in Puno! What are you waiting for? It is a Better Place to Stay right at Lake Titicaca. There are regular bus connections from Cusco to Puno (30-35 soles), Arequipa to Puno (90-115 Soles), Lima to Puno (140-160 soles) and Juliaca to Puno (around 25 soles) by bus. If you prefer the quicker way you can also take a flight from Lima to Juliaca ($211) or Arequipa to Juliaca ($140). 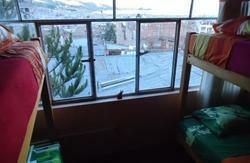 Once you are in Puno you can take a taxi from the bus station (from inside, no more than S/. 5.00 and from outside no more than S/. 3.50). If you have made your reservation in advance, we will arrange a pick up service for free!